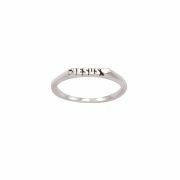 This solid sterling silver ring features "Jesus" with a smooth heart design. Available in sizes 3 th.. 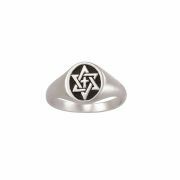 This solid sterling silver ring features an intertwined Star of David with a cross on a signet st.. 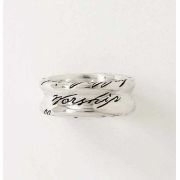 This sterling silver ring features "Jesus" with a heart engraved in a thin band. 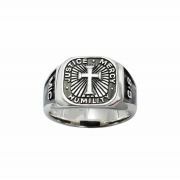 Available in sizes ..
We do not accept returns or exchanges if the incorrect ring size is ordered.Girl's surgical grade st..
A powerful reminder of walking with God, this signet style ring features Micah 6:8, "He has showed..
Silver Plated InspiRing- Jeremiah 29:11 available in 3 sizes: 6, 7, 8..
We do not accept returns or exchanges if the incorrect ring size is ordered.Constructed from Surgica.. This solid sterling silver ring features a simple dove design. Available in sizes 3 through 9, inclu..
We do not accept returns or exchanges if the incorrect ring size is ordered. Stainless Steel ring w..
We do not accept returns or exchanges if the incorrect ring size is ordered.Surgical grade steel, bl.. 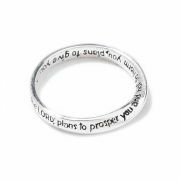 Inspired by Rick Muchow's song "Words of Worship", this men's sterling silver ring feature..
We do not accept returns or exchanges if the incorrect ring size is ordered.Stainless Steel black sp.. 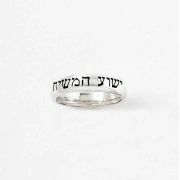 This handmade solid sterling silver ring features "Jesus the Messiah" in Hebrew. 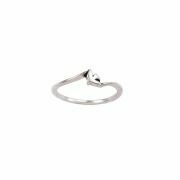 Available in sizes ..
We do not accept returns or exchanges if the incorrect ring size is ordered.Stainless Steel Ring wit.. 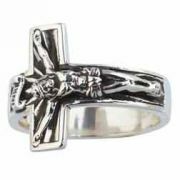 This sterling silver ring features a curved cross depicting the crucifix. 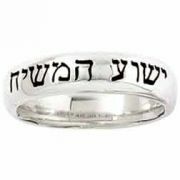 Available in sizes 8 throu..
We do not accept returns or exchanges if the incorrect ring size is ordered.Stainless Steel silver s..
We do not accept returns or exchanges if the incorrect ring size is ordered.Stunning 5mm stainless s..
Silver Plate4d Inspiring - Psalm 37:4 Size 6..
We do not accept returns or exchanges if the incorrect ring size is ordered.Stainless steel petite b..